When I first saw an aerial view of Palmanova a couple of years ago, I was intrigued by its beautiful star-like pattern. Recently, we decided to spend some time in Friuli-Venezia Giulia, a region in the northeast of Italy that includes Palmanova. 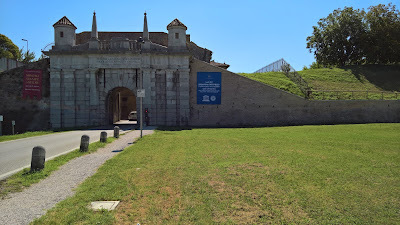 Being based in Udine for a few days with a rental car, it was a given that we would visit Palmanova to investigate. Palmanova walking map, brochure with map and routes. Between the 15th and 17th centuries, the Republic of Venice's mainland domains included parts of Lombardy, Veneto, Friuli-Venezia Giulia, Croatia, and Montenegro. 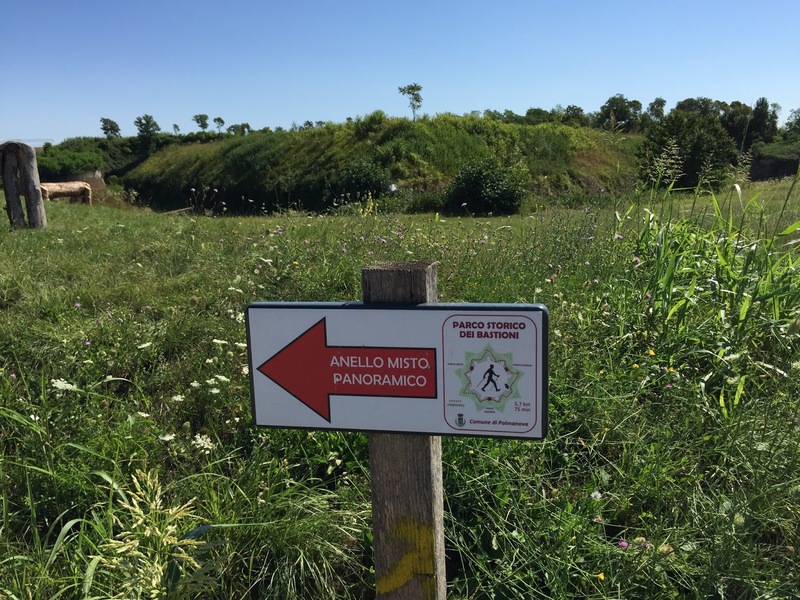 Today, key fortifications of the former domains are recognized by UNESCO in the Venetian Works of Defense. 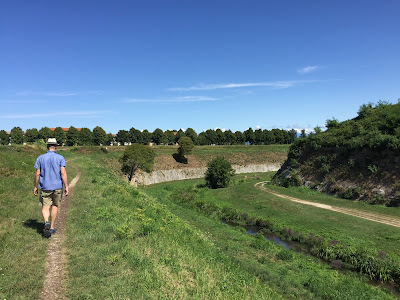 Palmanova, Bergamo, and Peschiera del Garda are three present-day Italian cities that once were part of the of Venice's mainland domains, domini di terraferma. 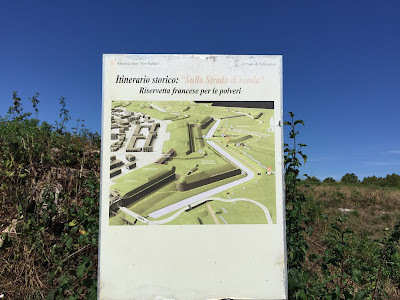 The city-fortress of Palmanova was created to defend the eastern borders of the Republic, while Bergamo was fortified by Venice in the same period to defend the western border. Others cities and locations in the list of Venetian defenses include Zadar and Korčula in Croatia, and Kotor and Dulcigno in Montenegro. 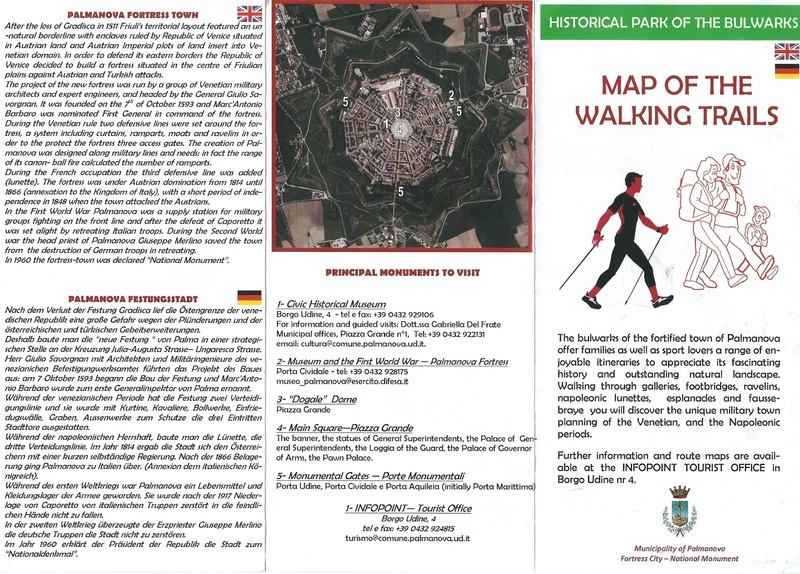 Palmanova became a UNESCO World Heritage site in 2006 and Bergamo in 2017. 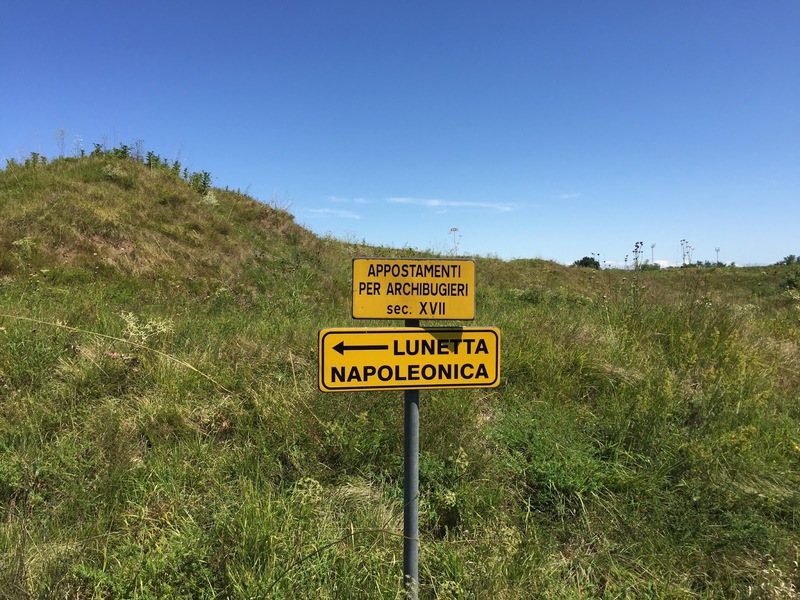 The first stone for Palmanova was placed on October 7, 1593 to commemorate the 22nd anniversary of the Battle of Lepanto, in which the Christians defeated the Ottoman Empire. The Venetian Empire was one of the main powers on the Christian side. 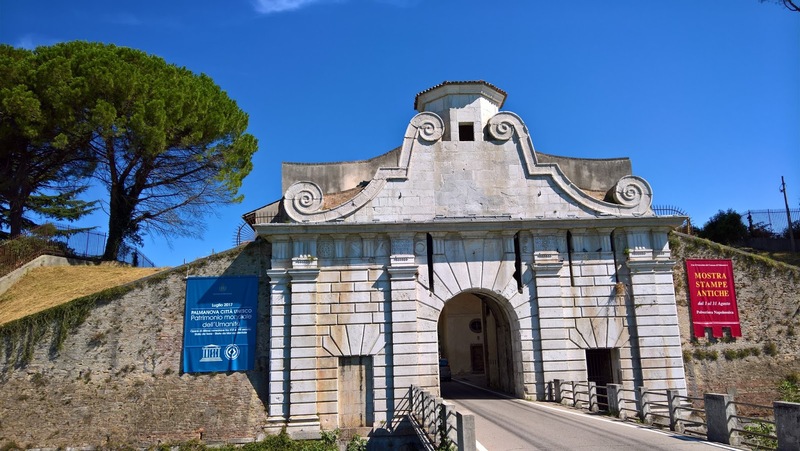 As suggested by Rome in the Footsteps of an XVIIIth Century Traveller, “Palmanova was justified as an anti-Ottoman defensive measure” even if the real problem in the late 16th century was coming from Austria. Being under Venice’s rule, you would think the city should have some reliefs of the Winged Lion of St. Mark, Venice’s symbol, especially above the city gates, but none were to be found. That's because when Napoleon walked into the city during the War of the First Coalition in 1797, he declared war against Venice and he had all the lions removed. Views of Palmanova. 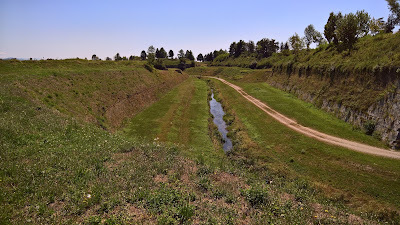 Left: Moat on north side of city. Center left: View north from second line of defense, west of the city. 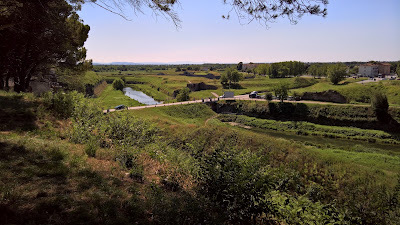 Center right: View southwest from the city wall near Porta Aquileia. 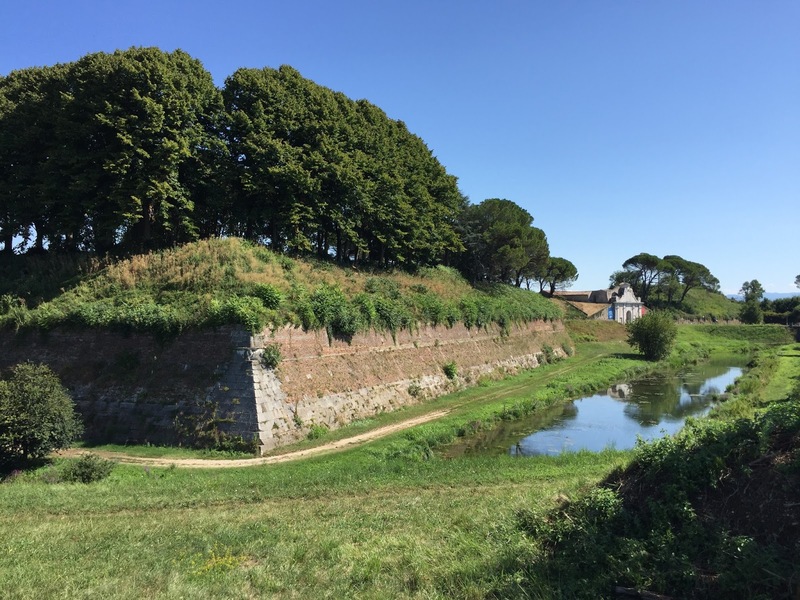 Right: View of bastion just south of Porta Udine. While Bergamo and Peschiera del Garda were existing cities that were fortified, Palmanova was purpose built as a city-fortress. But it’s not without a nod to elegance or utopianism. When I read up on Palmanova, I was surprised to find its planning was woven with a thread of utopianism as discussed in The Culture Wars of the Late Renaissance: Skeptics, Libertines, and Opera. Palmanova even resembles the visionary and never built city of Sforzinda. The city gate names tell you where they lead to. 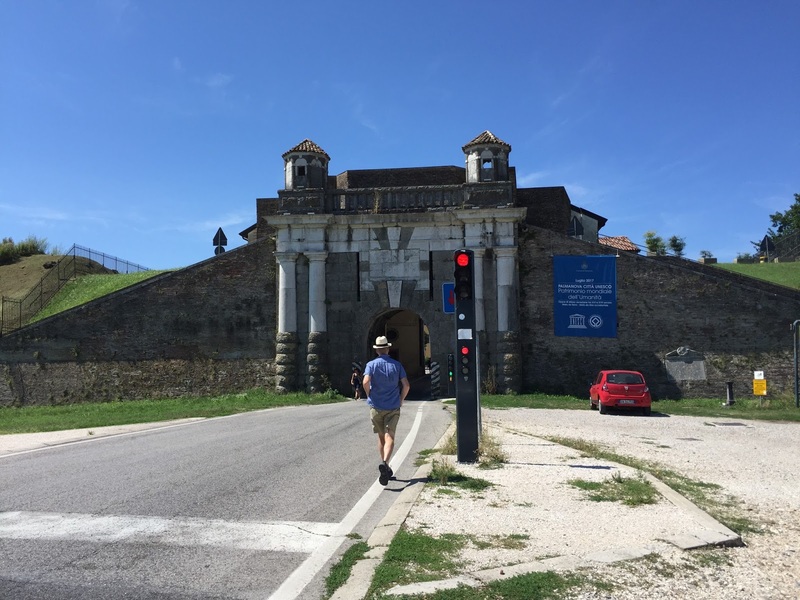 Left: Porta Aquileia. Center Left: Porta Udine. 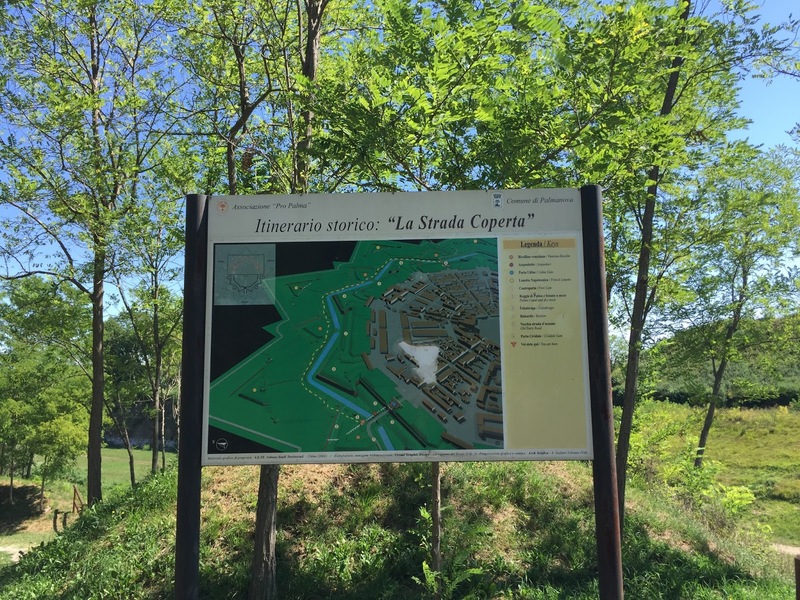 Center Right: Porta Cividale. Right: View of Porta Udine from the Roggia di Palma. 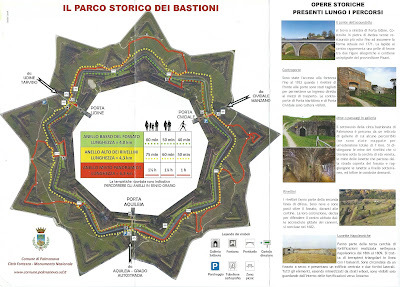 bastion (baluardo o bastione) – A projection from a curtain wall and used to protect the curtain wall and adjacent bastions. Usually arrow shaped. Also called a bulwark. cavalier (cavaliere) – A raised part within a fort or bastion so the artillery place there can fire over lower structures. curtain wall (cortina) – A wall between two towers or bastions. faussebraye (falsabraga) - A lower defensive wall outside of a fortification. lunette (lunette) – Similar to a ravelin, a fortification with a half-moon shape. The lunettes at Palmanova are a type of terreplein as well. 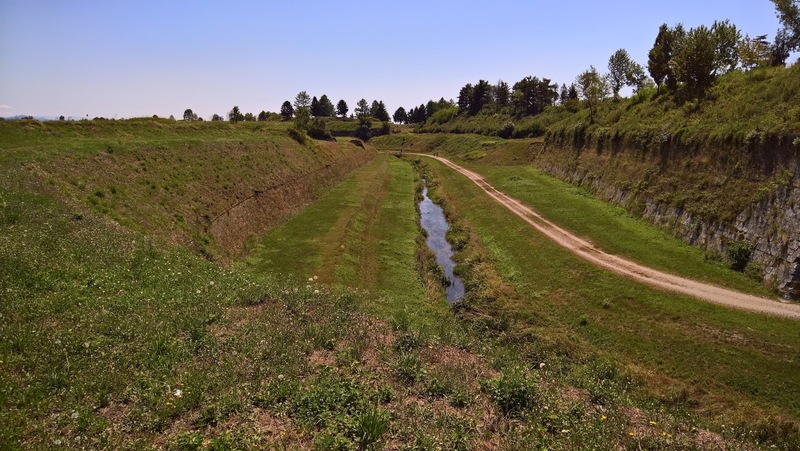 moat (fossato) – A ditch filled with water providing a line of defense around a fortification. ravelin (rivellino) – A fortification that is detached from the main fortification and located in from of a curtain wall and bastion. The ravelin’s goal is to divide approaching forces and attack them before reaching the more vulnerable curtain wall, bastion, or entrance. terreplein (terrapieno) – The top part of a rampart. 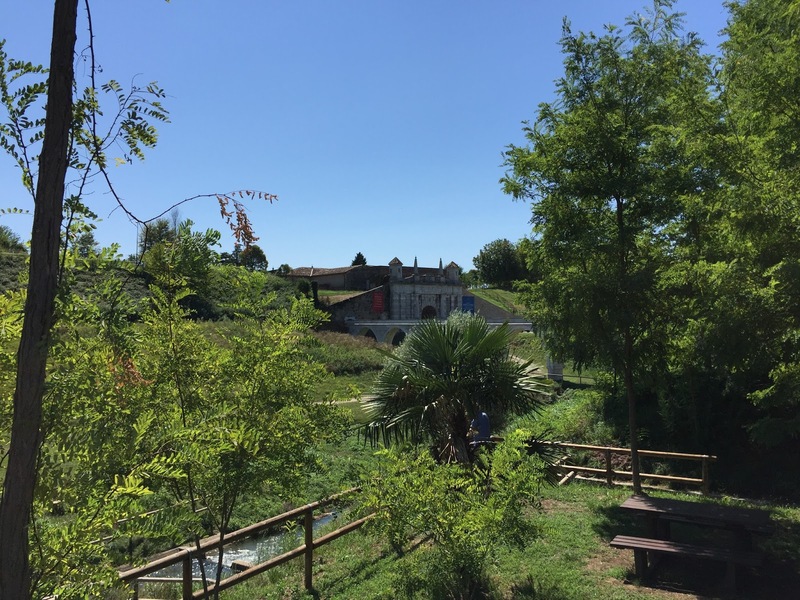 Some of the terreplein of Palmanova today are park spaces. Keep in mind as you walk around Palmanova that with increasing fire-power, there came changes and additions to the fortification. For example, towers connected with walls are fine when dealing with an enemy equipped with bows and arrows, but not so good if the enemy has cannons. Therefore, the tower and wall configuration gave way to star-shaped forts like Palmanova. 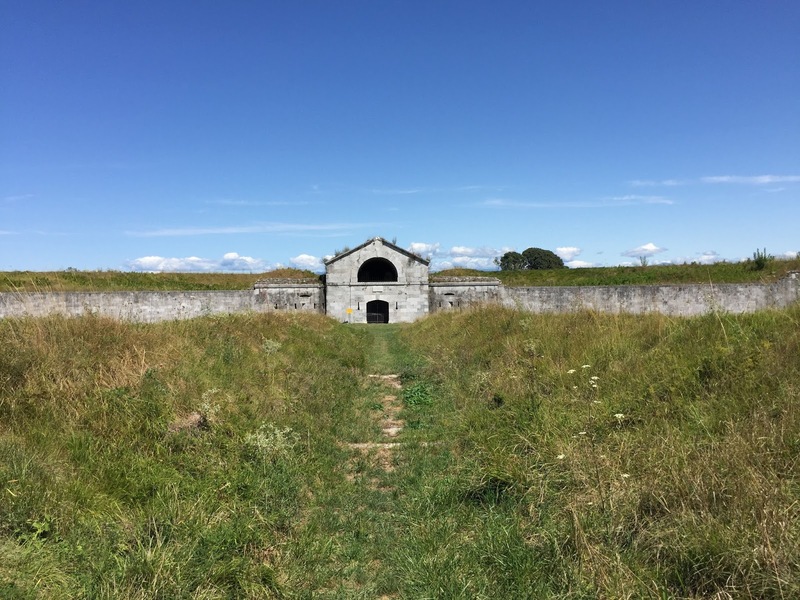 Star-shaped forts have an intricate arrangement of ramparts, bastions, ravelins, lunettes, and other structures for blunting the artillery of the enemy as well as protecting the artillery of the fortification from being destroyed. 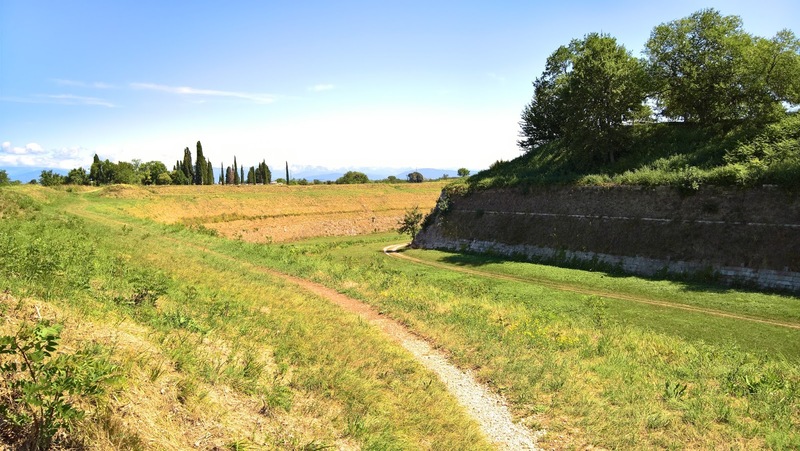 In the case of Palmanova, there are actually three defensive lines (or walls) surrounding the city. 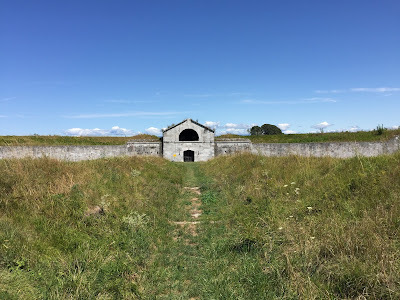 The first defensive line started in 1593, took about 30 years. The second two we can assume were added to keep pace with military advances or attackers. A second defensive line (ravelins) was added between 1658 and 1690, and a third line (lunettes) added during the French occupation. 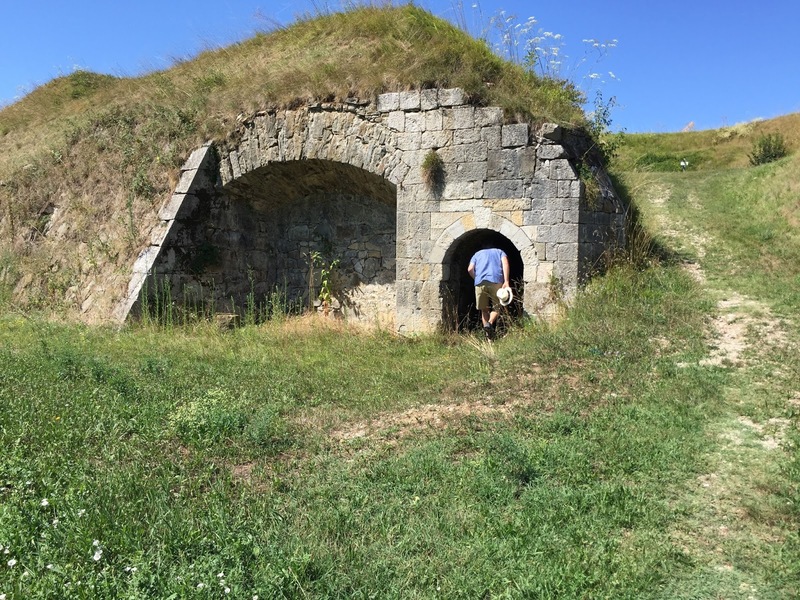 Even if the French removed all the lions, they did see the need to beef up defenses and keep enemies as far as possible from the city. Less lions, more lunettes. In the end, we walked two-thirds of the perimeter. 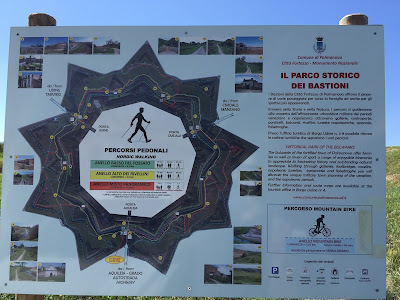 We went out the Porta Udine (6 o’clock on a watch face), and walked around, clockwise, to enter back in the city at Porta Cividale (2 o’clock on a watch face). 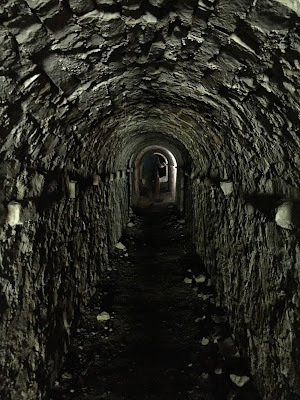 Along the way, we doubled-back on the east side of the city to discover some ravelins and tunnels, effectively doing a mix of red and yellow paths. Palmanova sits in the flat part of Friuli-Venezia Giulia not far from the upper part of the Adriatic Sea called the Marano Lagoon. In fact, after visiting Palmonova in the morning, we drove to Grado, an island in the lagoon, for lunch. Our first pick for lunch south of Palmanova, Mulino delle Tolle, was closed. Examples of signs around Palmanova explaining walk and biking routes and historic itineraries including "La Strada Coperta" - "The Covered Road" and "Sulla strada di ronda" - "On the Patrol Route". Signs and indications around Palmanova. Left: Itinerario storico - "Sulla strada di ronda - riservetta francese per le polveri". Center left: Sign pointing to a lunette built by Napoleon. Center right: A sign showing the red route. 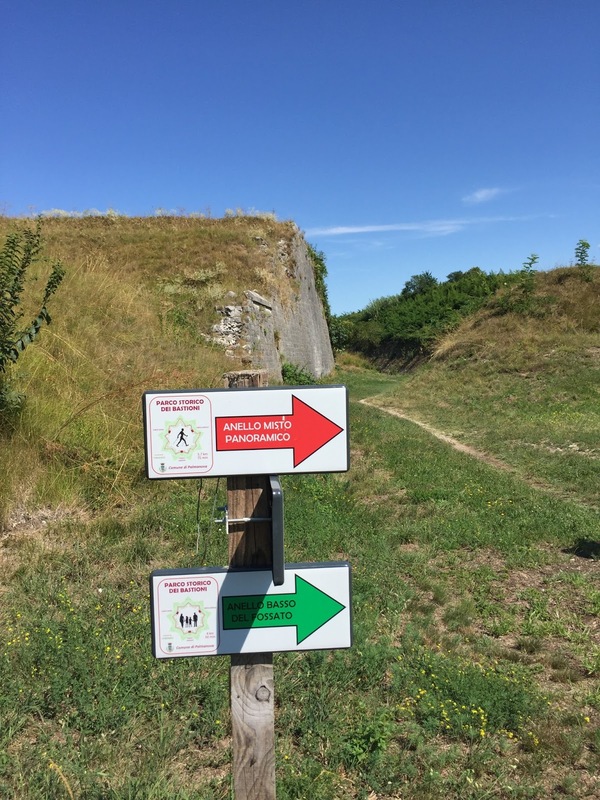 Right: Signs shows the red and green routes. 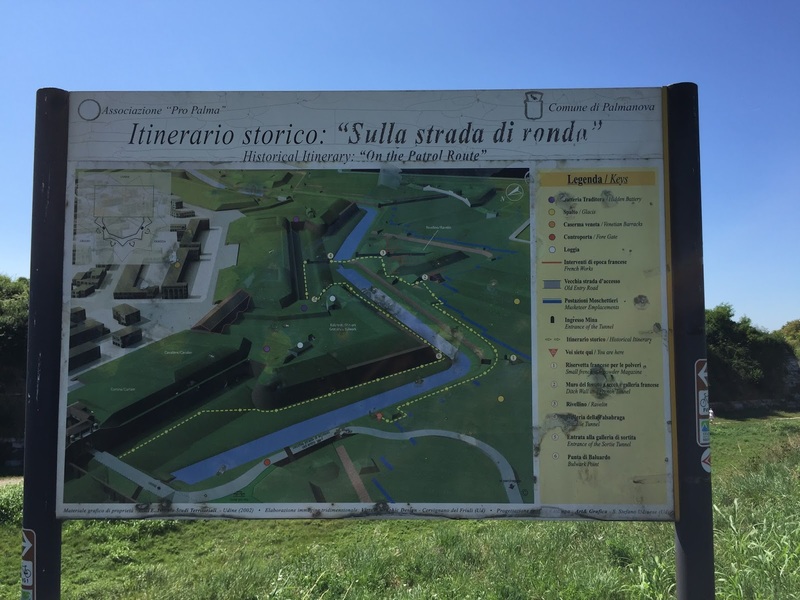 Features of the fortifications of Palmanova. 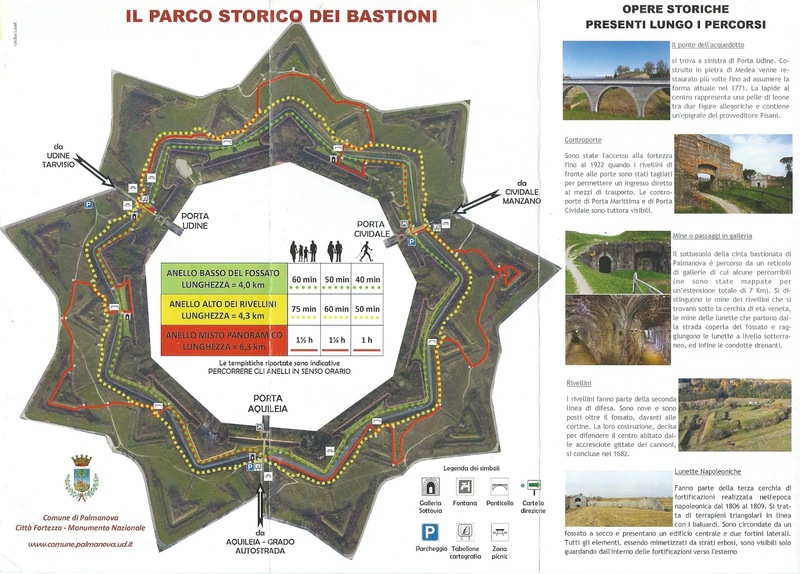 Left: A bastion near Porta Aquileia. Center: Investigating a ravelin west of the city - second defensive line. 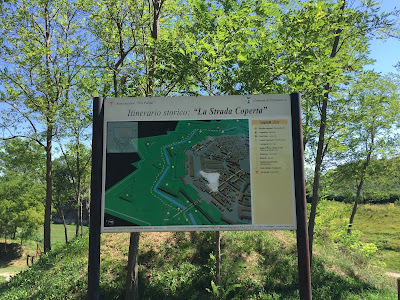 Right: La Caponiera Francese - north of the city. 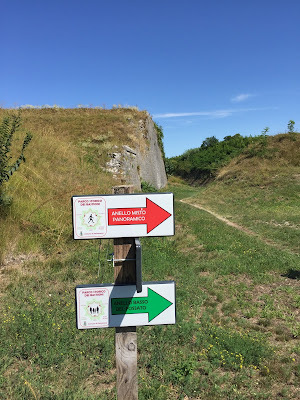 Left: Outside, walking around the moat, on the second defense line. 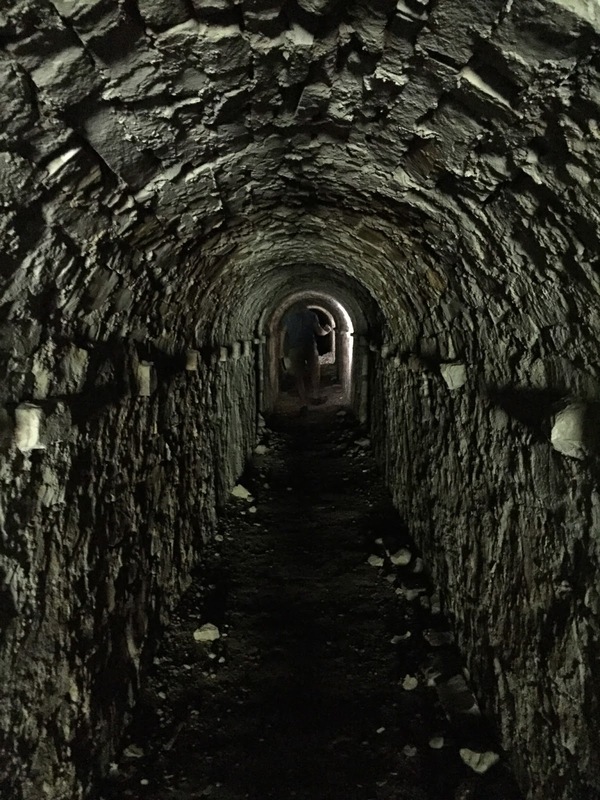 Right: Inside a tunnel in a ravelin of Palmanova.